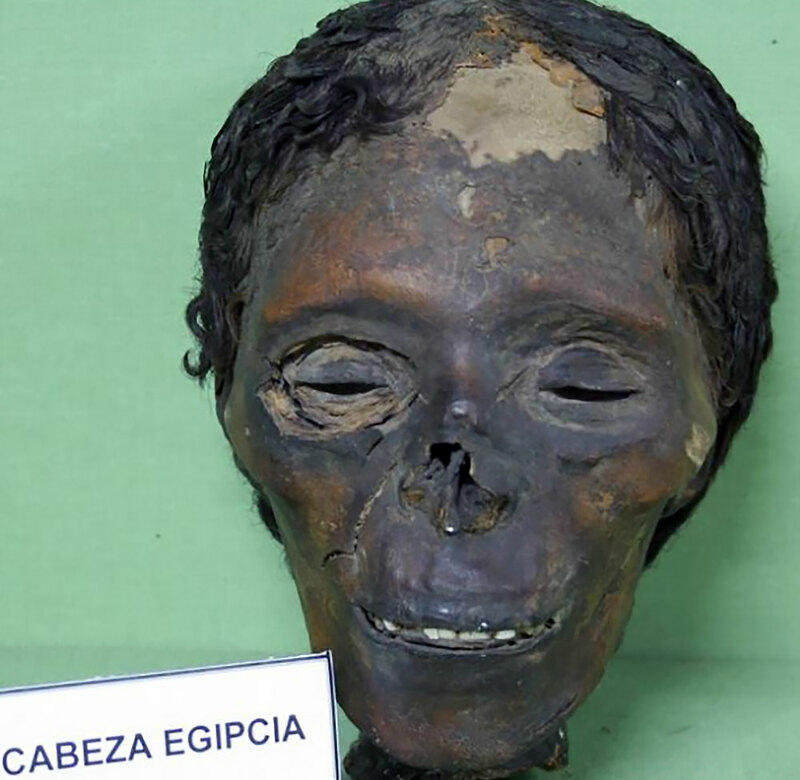 Egyptian mummified head bears traces of dermatosis linked with skin bleaching cosmetics. The head of an Egyptian mummy of approximately 3,500 year old, which belongs to an anonymous woman age 20-25, was examined by a scientific team of Greek and Spanish scientists. The mummified remains most possibly go back to the 18th Dynasty of the New Kingdom, in the archaeological area of the Theban Necropolis, and its embalming technique shows that the woman was an important member of the Egyptian society. The head shows tiny nodules under the cheeks and at the back of the neck, and a macroscopical as well as microscopical study have shown strong indications of a possible skin disorder called exogenous ochronosis. More precisely, samples were retrieved from the base of the neck and were sent for histological examination. The primary results showed a chronic skin inflammation, while immunohistochemistry confirmed it. Electron microscopy revealed striking similarities with contemporary tissue affected by exogenous ochronosis. Such dermatosis is caused by the extensive use of skin bleaching cosmetics, while it is known that ancient Egyptians regarded the use of cosmetics both for aesthetic purposes as well as magical and religious ones, and the use of such cosmetics was common among members of royal families. Dr. Despina Moissidou (Medical School, National and Kapodistrian University of Athens) and colleagues at the University of Madrid (Forensic and Legal Medicine, Medical School) presented their research at the recent International Conference of Comparative Mummy Studies in Hildesheim, Germany. Even though further investigation is needed, these results have revealed important information both on the head and the history of medicine.